ULTRA-FLEX is a high performance Liquid Urethane coating. It is a tough, durable, low VOC, coating that has many uses including but not limited to roof surfaces, water tower restorations tank liners, potable water tank reconstitution, sewer plant liners, ship and seaboard rust protection, piling coatings, boat bottom coatings, bridge repairs etc. It adheres extremely well to rusty surfaces and can be top coated with acrylic latex paint for color. This is a two part 9 to 1 ratio product. Mixed and applied properly ULTRA-FLEX will provide years of protection on any project. ULTRA-FLEX boasts an elongation of 375% at ZERO F., making it one of the most pliable coatings on the market today. ULTRA-FLEX is approved by California Standards for use in potable water containers and tanks. 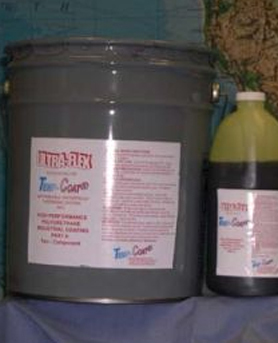 It is an excellent product for use in the restoration of concrete holding tanks and concrete slabs. ULTRA-FLEX can be used in conjunction with many chemicals. Please contact us for a copy of the chemical resistance chart and other pertinent information.